The first time I visited South East Asia on my round the world trip, my guide book had one page on Cambodia which mainly talked about land mines and the Khmer Rouge. At that time, while I was keen to visit the temples at Angkor, but I was slightly concerned that I might never been heard from again. So it was with eager anticipation several years later that I finally boarded a plane to Phnom Penh. For this particular trip, most of my planning had focused around cycling Cambodia and the temples of Angkor, so I hadn’t actually given much thought to the capital of Phnom Penh itself. On arrival, I was more than pleasantly surprised; for an Asian city it’s small and easy to walk around, with most of the main sights situated close to the river front with its faded, French colonial charm. Phnom Penh has eating and drinking for every budget and taste – deep fried Tarantulas anyone?! I couldn’t do it! If spiders aren’t for you either – you’ll find loads of fantastic restaurants along the river front where it’s worth popping into the Foreign Correspondents Club for a happy hour cocktail. I can also recommend the Fish Amok. My accommodation was close to the Independence Monument, which is a safe area with lots of hotels and restaurants, but the riverside area is a great location. 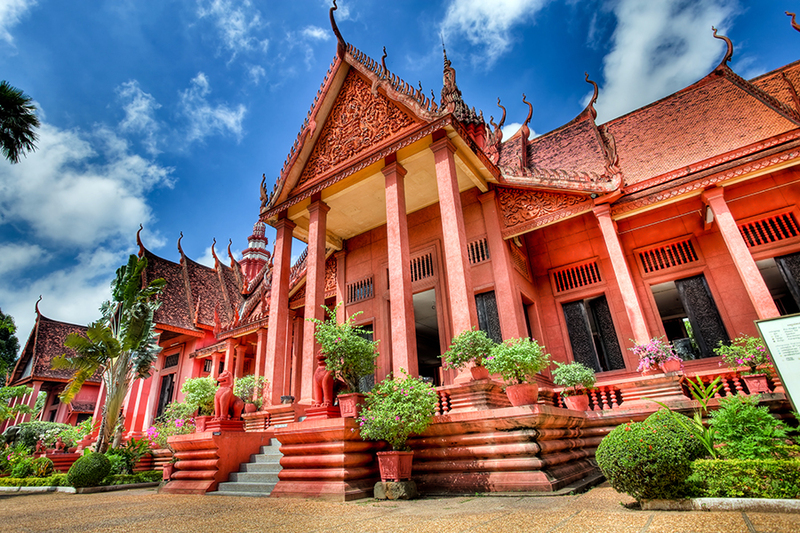 The other main sights of Phnom Penh that are worth a visit are the Royal Palace and the National Museum. I also took a trip to the Olympic Stadium to watch the early morning group aerobics sessions – a hilarious site which goes on all over the city in the early evening, as the young and old get into the (mainly Michael Jackson) groove. I thought it was important to learn about Cambodia’s grim past, so spent my first morning visiting the Killing Fields and the Tuol Sleng Museum. It was an overwhelming and sobering experience but it certainly left me with a better understanding of the brutal Pol Pot, the Khmer Rouge regime and its troubled (and comparatively recent) history of genocide. From Phnom Penh, it’s easy to reach the Islands of the Mekong which have a completely different feel to the city. I chose a local guide and ventured out by bicycle, where I found cycling through the quiet back roads was a peaceful way to see the Cambodian countryside and meet the locals. From Phnom Penh, I took a local bus to Battambang, or you could easily hire a driver. There are no longer any trains in Cambodia and the roads are not great, but I’d heard good things about Battambang. Battambang is much smaller and calmer than Phnom Penh and has some beautiful colonial architecture and again it’s a great place for cycling around the countryside. I managed to rent a bike in exchange for my Sainsbury’s nectar card as a deposit(!) and spent the day exploring around the river, followed by a visit to the night market. This time although I wasn’t lured by tarantulas, I did try some crickets instead – crunchy! I was very excited about my visit to Angkor and had made sure I didn’t arrive ‘templed out’. You can buy an entry pass for 1 day, 3 days or 7 days (I decided on a 3 day pass). I headed to Angkor Wat late in the afternoon on the first day and thankfully I wasn’t disappointed! It is exactly the amazing spectacle I’d anticipated - even with the crowds, the temple complex is big enough to wander around without feeling overwhelmed by the masses. The next day I arranged a cycle trip with some off road cycling to get away from the crowds. Angkor is about 10km from central Siem Reap so if you’re spending all day here exploring, be sure to stop for lunch during the hottest part of the day. My guide took us to some more off-the-beaten-track-temples, some overcome by the jungle. Bayon was my favourite (the 'many faced' temple), but we also went to Ta Phrom where nature has run wild the giant tree roots engulfing the building. 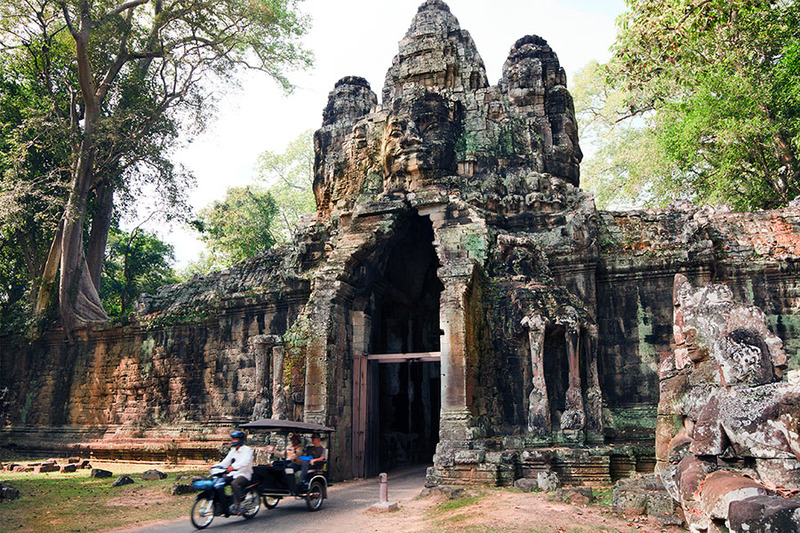 I would definitely recommend a guide for at least one day here and infact I’d enjoyed Bayon so much that on my final day, I rode back there again and also ventured to some of the outer temples - each one completely different yet all amazing. 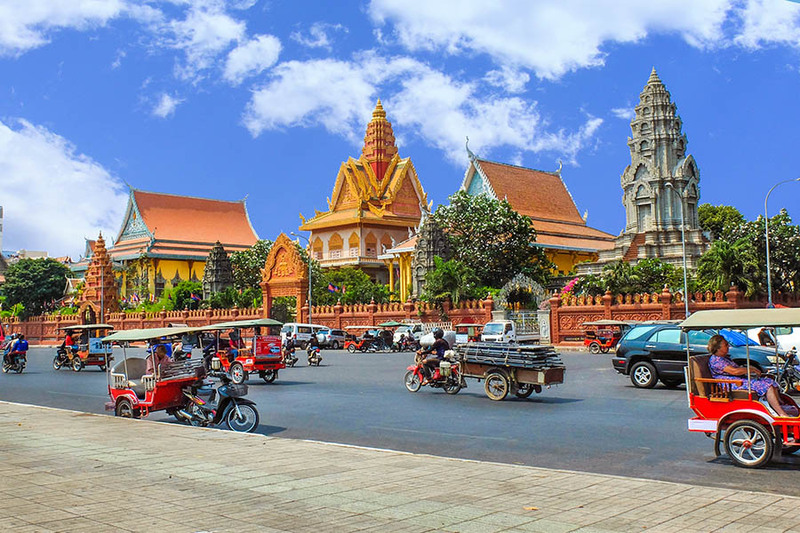 Siem Reap is the fastest growing city in Cambodia; it caters for visitors to Angkor and has its own airport with plenty of regional connections, including to Bangkok. 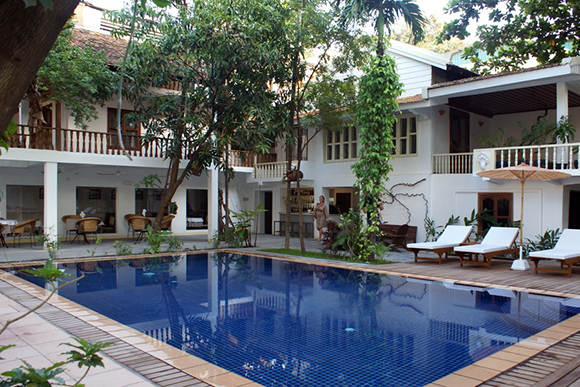 Accommodation varies from backpacker hangouts to the smartest hotels and everything in between. 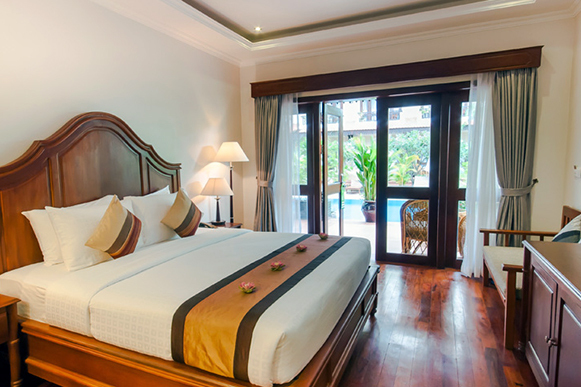 It can be quite a hot business if you’re cycling, walking and clamouring around the temples all day, so I would recommend a hotel in Siem Reap with a swimming pool. Hotel-wise, it’s more tranquil to stay out of town and there are lots of lovely hotels close to the river but not right in the centre. You have to buy a Cambodian visa on arrival for USD$30 (you’ll need a passport photo so take a few with you). This must be payable in US dollars, cash only. If you take a tuk tuk from the airport, you will arrive covered in a thick layer of dust! Taxis are available too, a much cleaner option! Cambodian currency is the Riel but the $US Dollar is accepted pretty much everywhere. If you’re interested in travelling around Cambodia, or combining Cambodia with Thailand or Vietnam, there are many ways to explore. 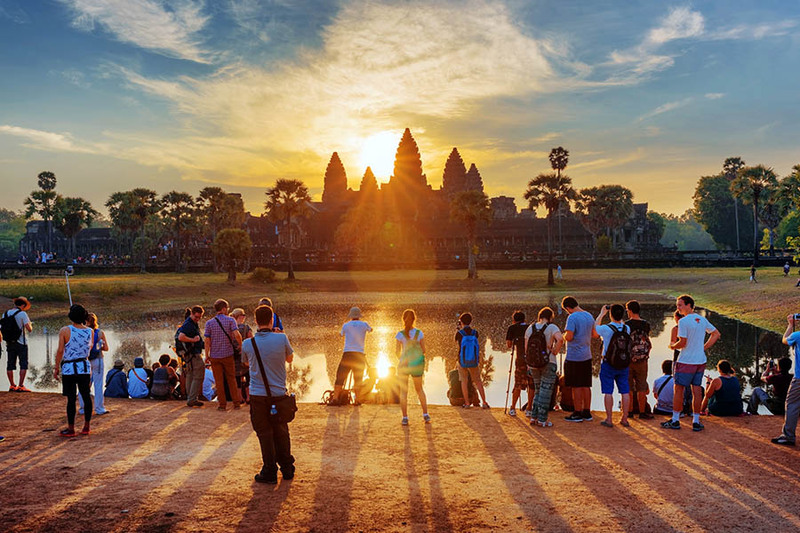 We can tailor-make a holiday in Cambodia, or organise a stopover in Siem Reap to visit Angkor. Cambodia is also a perfect cycling destination as I found on my trip, so ask us if you would like to add in some day cycle tours or a longer trip. I would have taken this Cycle Indochina Adventure with G Adventures if it had operated when I visited. To start planning – just call us on +44 1273320580 or request a quote by email.